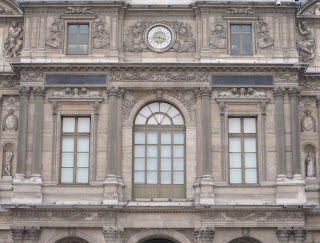 After the death of Henri II in 1559, the development of the Louvre took a new direction, and it wasn't until 1625 that work on the courtyard resumed. The architect chosen for the job was Jacques Lemercier. In order to enlarge the courtyard, Lemercier first created a central pavilion. 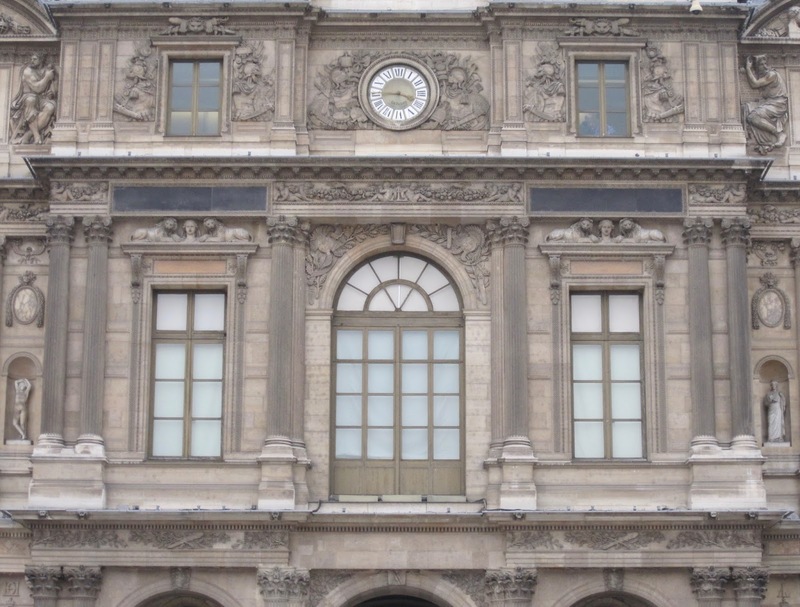 This was later named Pavillon d'Horloge after a clock that was inserted into the facade. One of the most notable features of the pavilion are the caryatids, which were sculpted by Gilles Guerin and Philippe de Buyster in 1638, to a design by Jacques Sarrazin. The choice was probably made to respect one of the rules of classicism, which prescribed that no order should be used above the composite. Lescot had used this order on the first floor and Lemercier therefore had to come up with some other form of decoration. It is also a likely nod to Lescot's Salle des Caryatides on the ground floor of the Lescot wing, where caryatids were first used to decorate a musicians' gallery. The caryatids support a series of pediments: a triangular within a segmental within a triangular. Similar motifs can be found in mannerist architecture in Italy, as for example in Michelangelo's Porta Pia in Rome. The composition also includes sculpture of two winged female figures. These are Greek allegorical deities representing fame, known in French as Rennommées. Like the caryatids, they were sculpted by Guerin and de Buyster in 1638, to a design by Sarrazin. The pavilion also introduces the first toit a l'imperiale, which is a kind of bulbous dome. Louis XIII left his signature on the frieze on the first floor and on the keystone of the central arch on the ground floor. The letter on the ground floor is a double-Lambda, which is the Greek equivalent of a Latin L. On the first floor, the L is interlaced with an A for his queen Anne of Austria. For the extension of the west wing, which has since been named after the architect, Lemercier duplicated Lescot's design and added a pavilion at the northwest corner. Pavillon de Beauvais was originally built to the same design as Lescot's Pavillon du Roi, though both have since been removed from the skyline. While there was a lag of over ten years before sculpture was added to the central pavilion, it took almost two hundred years before the decoration was completed on the Lemercier wing. The relief work in the attic is dated to 1806 and the ground floor to 1820-23. The one exception is around the oeil-de-boeuf nearest Pavillon de Beauvais. This motif is by Gerard van Opstal and was done in 1638. The statues in the niches of the ground floor are from 1866-74. The west front of the central pavilion is usually referred to as Pavillon Sully. Originally quite plain, it was covered in relief sculpture in the late 1850s.